The UNISA Application Closing Date for 2018 second-semester was 26 April 2018. All applications for 2018 are closed. You can only apply now to study at Unisa in 2019. Get all the dates about applications for 2019 here. The UNISA application dates for the second-semester is from 16 April 2018 to 26 April 2018. The first-semester UNISA application closing date for 2018 was on 02 February 2018. If you want to start your studies in July 2018, you need to apply between those dates. 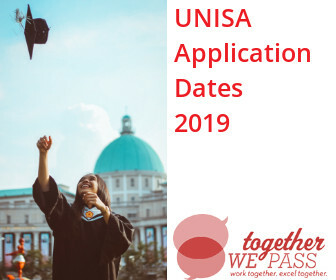 All UNISA application dates 2018 second-semester information is available on the UNISA website. If you want to be in school, study at a college, university or any institute, you first need to apply. They need to review your application and see if you are fit to study the qualification you want to pursue. Another important thing is that you can only register if you applied. Once you have received confirmation that your application was successful, then only you can register. If you apply early and are accepted, you are one ticket closer to study with UNISA. Semester two have limited space available. UNISA cannot guarantee acceptance of applications. Can Anyone Apply for UNISA Second Semester 2018? Unisa Second Semester 2018 is closed. However, anyone can apply to study with UNISA, even if it is your first-time applying. The UNISA application process is very easy. The first thing that you need to know, there are different ways to apply for UNISA. To apply is quite easy, but you need to make sure that you have everything in order. All of the information is available on the UNISA application webpage. Application fee due date is the same closing date for applications. Make sure that you keep a copy of your proof of payment. Are All UNISA Qualifications Available for Study in the Second-semester? No, not all of the qualifications are open for second-semester. Some of the These are the only available qualifications open for second-semester application. You can view them all on the Unisa applications Facebook group. Stay up to date with everything about UNISA, and join one of their Facebook groups.